Having troubles managing your website ? Relax, we are here to make managing content as easy as pie. Existing CMS Support with an in house multi skilled development team; Conceptol is also able to assist you with your existing CMS. Many companies and organizations discover the need for development; training or technical support and for a multiple of reasons require a new partner for these services. We Help You Choose The Right CMS? 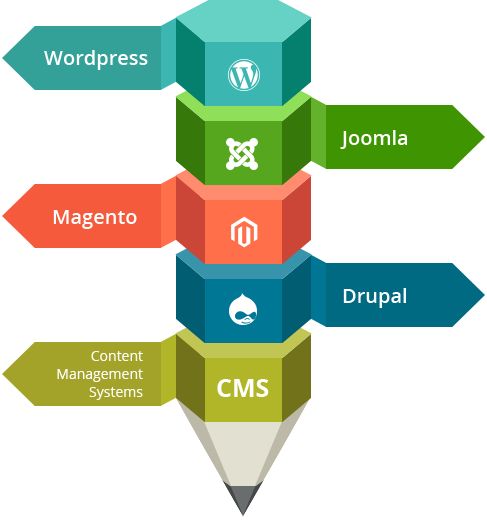 Today Content Management Sytems (CMS) platforms have evolved into powerful tools which allow you to maintain; market; and publish your web content. All the CMS platforms have inbuilt tailored tools for different situations. That’s why before we recommend a content management system for your website we analyze and understand the requirements a CMS needs to fulfill. At Conceptol we don’t stick to a single platform, unless and until we have considered the scope; project type; content and functionality that a CMS needs to look after we won’t recommend you a CMS platform. With the right tools you will have the level of control on your website you want to have. With our in house training you and your elected staff will be able to manage content confidently; extract the data you want while keeping website maintenance costs under your control. We offer our services on a number of leading third party CMS including WordPress; Magento; Drupal; Squarspace and Joomla amongst many others. Get CMS Support on your existing CMS with Conceptol’s multi skilled development team. Many times companies and organizations need assistance on development; training or technical assistance.